What Can A Republican Senate Majority Do For Ukraine? WASHINGTON, DC -- The Republicans’ victory in the mid-term elections gives them control of the U.S. Senate and a greater voice in foreign policy. 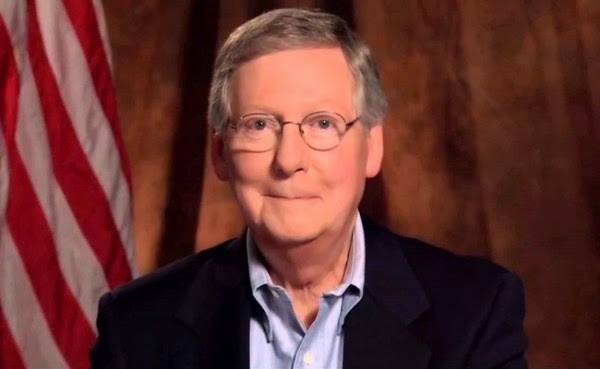 Expected new Senate Majority Leader, Mitch McConnell. With a Republican senate majority, legislation opposed by Obama’s Democratic anti-war wing can no longer be kept from the floor, as it was under the outgoing Senate Majority leader, Harry Reid. The expected new Senate Majority Leader, Mitch McConnell, indeed vowed, in his first post-election press conference, to expeditiously move legislation to the president’s desk for his signature (or veto). Ukraine can hope that pending pro-Ukraine bills will go to the front of the queue, especially if Ukrainian, Baltic and Polish Americans make their voices heard, let alone those who understand the global threat that Putin’s Russia poses. S.2828, the Ukraine Freedom Support Act of 2014, calls for military and security assistance to Ukraine, designates it as a Major Non-NATO Ally, and imposes further sanctions on the Russian Federation. The bill was introduced by the Chairman and Ranking Member of the Senate Foreign Relations Committee, Sens. Robert Menendez (D-NJ) and Bob Corker (R-TN), and was passed unanimously by the committee. Barack Obama can scarcely veto a bi-partisan pro-Ukraine bill. The Kremlin has little more to escalate other than an outright attack on Kiev or a NATO country. His support of the illegal Donetsk and Luhansk elections, moreover, makes clear that Putin has no interest in a peaceful solution of the Ukraine crisis. An Obama rejection of Ukraine military aid would put him at odds with powerful Congressional foreign policy voices from both parties (Ben Nelson, Sander Levin, Jim Gerlach, Gerland Connoly, Robert Menendez, John McCain, Bob Corker, to name just a few), with American foreign-policy experts (Mike McFaul, Strobe Talbot, to name just two), and with military establishment figures (Generals Martin Dempsey, Philip Breedlove et al.). Likely presidential candidate and former secretary of state, Hillary Clinton, also sees the anti-Putin writing on the political wall. The Ukraine military aid bill may even come from the new Congress with a veto-proof super-majority, leaving Obama with no choice in the matter, even if his anti-war faction is outraged. The people of Ukraine and its leaders have puzzled why the United States has refused to help them. After all, they have been fighting alone against Russian expansion on behalf of Europe and the United States. The Minsk ceasefire has collapsed, and Putin’s conquest of the rest of his Novorossiya is about to resume. Ukraine is desperately sending ill-equipped troops to defend the encircled port city of Mariupol and other vulnerable towns and cities of southeast Ukraine. Russian separatist/mercenaries virtually on a daily basis. Even with expeditious passage of a military aid bill for Ukraine, precious time will be lost in getting the cogs of Washington machinery moving. Also, Ukrainian troops must be trained on the new equipment. Skeptics could ask whether the U.S. simply waited too long to oppose the behemoth of the Russian military. No, it is not too late as long as an independent Ukraine continues to stand, willing to fight for its existence. Putin’s vulnerability is that he cannot tolerate substantial battlefield losses. His propaganda describes the Ukrainian conflict as a civil war fought by Ukrainians against Ukrainians. Of course, Putin’s media says, Russia is helping the “good side,” but there is no need for young Russian conscripts to die. Putin has gone to great lengths to cover up some two thousand or more casualties among Russian service men, but the loss of sons (in a country of one child families) cannot go unnoticed by their mothers, who form committees of mothers of soldiers, which Putin cannot continue to brand as foreign agents. Putin’s other vulnerability is declining Russian living standards associated with sanctions and the collapse of the ruble. The Kremlin promised an antiseptic humanitarian campaign to protect the enslaved Russian population of Ukraine—at no cost to the Russian people. The Russian people are not stupid. They make the connection and wonder why they should make personal sacrifices for the people of remote Crimea, Donbass or a Novorossiya that does not even exist on most maps. Patriotism is a good thing but not if it comes with a high price tag, such as the loss of lifetime savings to inflation and lower pensions. With the change in control of the Senate and the possible passage of a real military assistance bill, Ukraine will realize the tragedy that they were held hostage to American electoral politics as almost 4,000 died in wartime violence. We must understand why they will hold a long-term grudge.